Former York High football coach Eric Lauer got an up-close look at Penn State’s football operation before the Fiesta Bowl. And he came away impressed over the other teams he’s seen over the years. Here, he poses with the bowl mascot, Spirit. They were trying to make them fumble then, so they wouldn’t during the game. It was a simple and yet powerful message to the players. It also was one to a former York High football coach who was watching every moment of that workout last week leading up to the Fiesta Bowl victory over Washington. Eric Lauer, a former Bearcat player and then head coach, was talking about the behind-the-scenes secrets to Penn State’s success. The bowl season is one of the best times for coaches like Lauer, who has lived around Phoenix for the past decade. 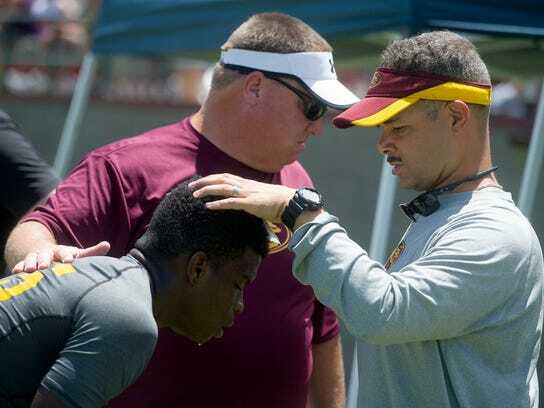 He’s now the offensive coordinator and assistant head coach here at powerhouse Mountain Pointe High. Each December he and the other prep coaches in the areaattend team practices leading up to the Fiesta and Cactus bowls. They get to meet the college staffs and observe and learn. It’s all about developing relationships and helping improve their own systems. And Lauer said he was a bit surprised at James Franklin’s operation. He said it was the most efficient and well-organized of any school in the seven or eight years he’s been watching teams come to town. He said the difference was in the little things, the details. No wasted minutes. The never-stop, upbeat body language. And the willingness to continue drilling well-worn fundamentals at the end of the season when time is precious. Like that ball security drill, something Lauer doesn’t remember other schools working on like that during bowl week. The Nittany Lions, by the way, set a school record by losing only three fumbles all season. They fumbled only eight times overall, though two did come in the Fiesta Bowl after not playing for a month. Saquon Barley, for example, did not fumble over his final 21 games, covering 377 carries. The Lions also were one of the least-penalized teams in the nation. “It’s something you kind of think as a coach, ‘Let’s spend time doing something else.’ But they’re doing to do it because of how important it is. “Sometimes we blame the kids (for mistakes in games), but are you really coaching up what you want to see on the field? If you don’t want the ball on the ground you’ve got to practice that. Lauer said he had no previous connection to Penn State beyond watching the program on TV while growing up or through former teammates and friends who went there. He had never met Penn State coaches, never attended their football camps. He knows other staffs better, like the Washington Huskies and USC Trojans, because they recruit Phoenix regularly. He was impressed with Penn State’s urgency and enthusiasm — things missing at times from other teams. He said the continual positive energy Franklin and his assistants show their players during practice and before the Fiesta Bowl can resonate much deeper than most realize. Lauer said he saw the reinforcement throughout, from hugs and handshakes and pats on the back. There were one-on-one teaching moments. There was yelling and whistle-blowing but no cursing. Every staff member was “up on his toes, bouncing … running the entire practice,” Lauer said. He said it was almost as if the players were searching out those interactions. “It was like, ‘It’s game time, I get my hug.’ It’s coaching from love, not coaching from fear. And when I get that I’m going to just play that much harder for you.